A new supernova discovered by students in London is starring in a new webcast, and you can watch it live online today (Jan. 30). Supernova 2014J was spotted by four undergraduate students observing galaxy M82 while astronomer Steve Fossey taught them how to use a telescope at the University College London Observatory on Jan. 21. Fossey and his students will take part in the online Slooh Space Camera webcast about the exploding star discovery beginning at 4 p.m. EST (2100 GMT). You can watch the live broadcast featuring views of the new supernova on Space.com via Slooh. SN 2014J is the closest of its kind to Earth in more than 40 years. Ben Cooke, Tom Wright, Matthew Wilde and Guy Pollack — the astronomy students speaking with Slooh today — caught sight of the star explosion after Fossey saw something odd when adjusting the telescope. 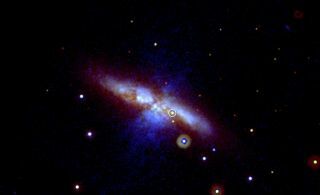 They found the new supernova by checking an online archive of M82 images and seeing that it was a new feature on of the galaxy. "The weather was closing in, with increasing cloud, so instead of the planned practical astronomy class, I gave the students an introductory demonstration of how to use the CCD camera on one of the observatory's automated 0.35–metre [13.7-inch] telescopes," Fossey said in a statement from UCL. The new supernova is about 11 million light-years from Earth and is expected to brighten until Feb. 2, when it might be visible with only binoculars. Scientists think the new star explosion is a Type 1a supernova — the kind astronomers use as "standard candles" to measure cosmic distances because they have comparable intrinsic brightness. NASA is planning to make observations of SN 2014J using observatories like the Hubble Space Telescope, the Nuclear Spectroscopic Telescope Array (NuSTAR), the Fermi Gamma-ray Space Telescope and the Chandra X-ray Observatory. The space agency's Swift spacecraft has already taken images of the new supernova. "Finding and publicizing new supernova discoveries is often the weak link in obtaining rapid observations, but once we know about it, Swift frequently can observe a new object within hours," Neil Gehrels, the Swift mission's principal investigator at NASA's Goddard Space Flight Center in Greenbelt, Md., said in a statement on Jan. 24. You can also watch the supernova webcast directly from Slooh at http://events.slooh.com/.